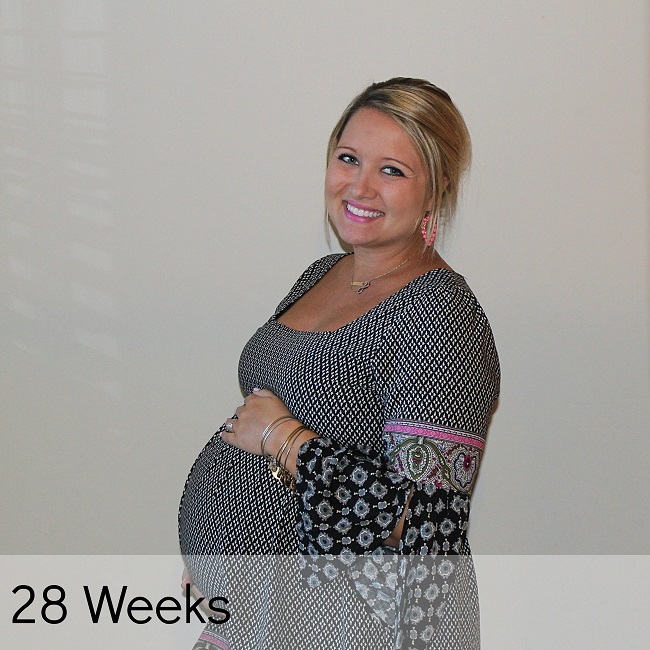 How far along: 28 weeks - hello third trimester!! Baby is the size of: a head of cauliflower/ a coconut/ an eggplant. She's about 16 inches long from head to toes and weight somewhere between 2.5 and 3 lbs. At my doctor appointment yesterday she was measuring right on track! This week she has started to develop more fat, so her wrinkly skin will start to smooth out soon. Symptoms: Same ole' lower back pain and SPD. It's usually worse in the mornings, but once I get up and get moving around things feel better. I'm still dealing with breakouts on my face, but I've come to realize those are probably here to stay until after I give birth. Movement: Oh, yes! She must have gone through a growth spurt last week because her movements have become much more intense over the last week or so. Steven has been able to feel her a few more times since last week, and my dad was able to feel her moving over the weekend. We have weekly meetings at work every Monday morning, and she was going crazy moving around this past Monday! I could see my entire stomach jumping up and down throughout the meeting. It was so much fun to sit and watch. Nursery: We are once again making progress in this department! Steven and I brought home the glider over the weekend, and my wonderful mother-in-law is painting the armoire for us. My mom actually had the armoire we are using built for my nursery 26 years ago. Since then it's moved from house to house and was most currently being used at my parent's lake house. I was really dreading having to re-paint it, so I owe my mother-in-law big time for offering to do it for us! You can see her nursery inspiration here. Maternity Clothes: Yes, and I don't see this answer changing anytime soon. I think it's about time to remove the category and replace it with something else. Sleep: Tossing and turning, but I can't complain. I'm able to fall asleep easily at night, and so far I can still make it through most nights without having to get up for a potty break. Kane cuddling with his little sister. Best moment this week: Spending time at the lake over the weekend and getting more progress done in our girl's nursery. Missing anything: Sleeping on my stomach and back. Cravings/Aversions: I thought I was finally getting over my aversion to chicken this week, but that was short lived. I am, however, finally starting to come back around to the idea of hot green vegetables. Looking forward to: Football season starting in just a couple of weeks! Husband is: Tolerating my newest pregnancy tendency - nesting. I came home last Friday after work and immediately started cleaning the house. I now have an entire list of things that need to get done before Charlie Beth's arrival. New mommy question: Nothing that I can think of this week. Love love love - you are precious! Where in the world did you get that beautiful dress?! Looking good mama! How fun that you are feeling and seeing her move so much (that's a sure way to make work meetings more fun!!) I can't wait to see your nursery. Wow I can't believe you're in the third trimester!!! Love the picture of your baby bump and Kane. Can't wait to see some pictures of the nursery. Can't wait to see the nursery! We're still in the process of making the bedding for ours, but pretty much everything is bought just needs to be hung on the wall and whatnot. Love that picture of the puppy and the bump! They'll be bestest friends!! And of course, you look gorgeous as usual! Can't wait to see what y'all do with the nursery! I cannot believe how fast time is going by! 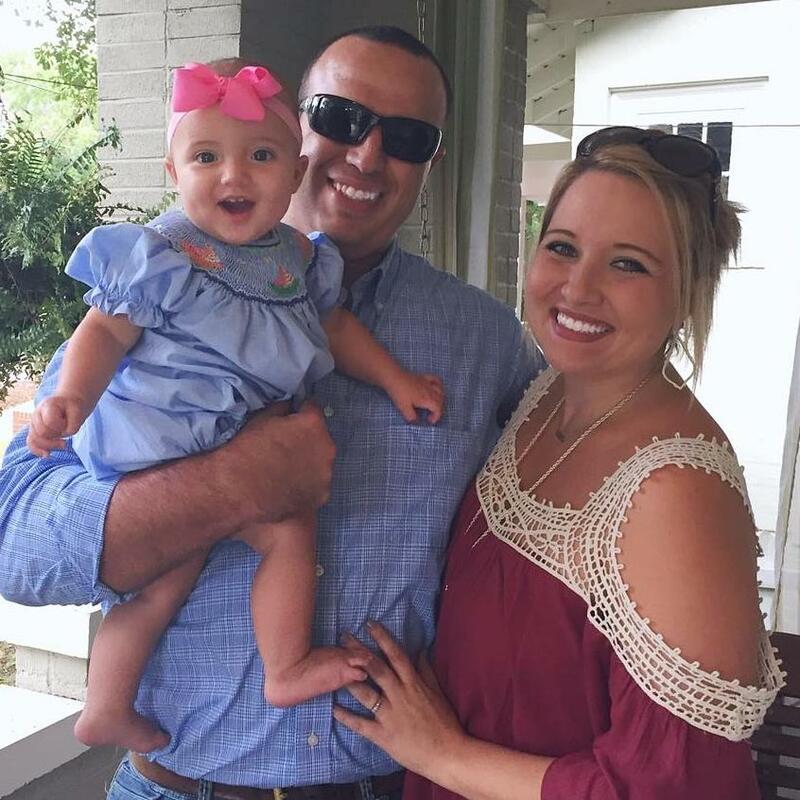 You are looking great, and I cannot wait to see what you do with her nursery!